Sorry for the lack of posts lately! Last week was very interesting! Hubby was traveling on business, and we had a whopper snow storm Tuesday. I usually plead ignorance when it comes to running our 4-wheeler, but I had to figure it out Wednesday morning to push some snow. Most of the snow blew around and didn't settle too much, but we had some good drifts on the driveway between the house and barn. The boys managed to help me get it started, but I did have to call and see how to put it in reverse!!! he he. They don't make that easy! It wasn't the prettiest plow job, but it worked. And most is melted by now anyway. OK, on to stamping: here's a sneak peak from the upcoming Occasions Mini catalog (March 1-May 31 2008). I made this last night at a stamp club. I was pretty brain dead at that point from the week to date. I think this could be better, but it's a start! The set is Bloomin' Beautiful. 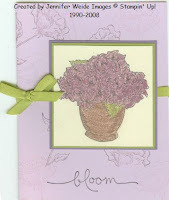 Card base is Pale Plum CS, stamped randomly with a long stem flower image in both Pale Plum & Perfect Plum classic ink. "bloom" is across the bottom in Basic Black. The main image is stamped on Naturals Ivory CS with Basic Black ink and colored with Metallic Pencils. I do prefer the image to be embossed when I color with these, but didn't have EP with me. The ribbon is the NEW Poly-Twill in Old Olive. We will have both the Olive and Chocolate Chip! Fun Fun!! Hopefully I'll be stamping a little more this week than the last few. I have a swap to figure out, so there will at least be that! Wish me luck-both in finding time to stamp, and with life in general-I'm now Mom to a teenage boy as my oldest turned 13 today. He's really a great kid but we've already experienced some new "attitude". He's upstairs though now, happily playing his new guitar! !